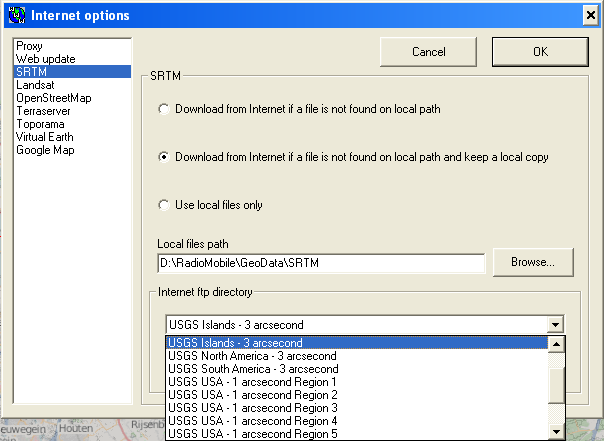 Radio Mobile can be configured using various sources of SRTM data. This is configured in 'Options > Internet > SRTM'. The in the pull-down menu displayed options for SRTM sources is stored in the file internet.dat. With version 10.4.7 a new version of Internet.dat (in rmwcore.zip) has been released with an updated list of download sites. DEM_TYPE Specifies the type of DEM. possible types are SRTM and LAND. LAND is Landcover in LCV format.